Now that you are thinking of adopting a Turkish Van, it is time to consider carefully the breeder you will work with. 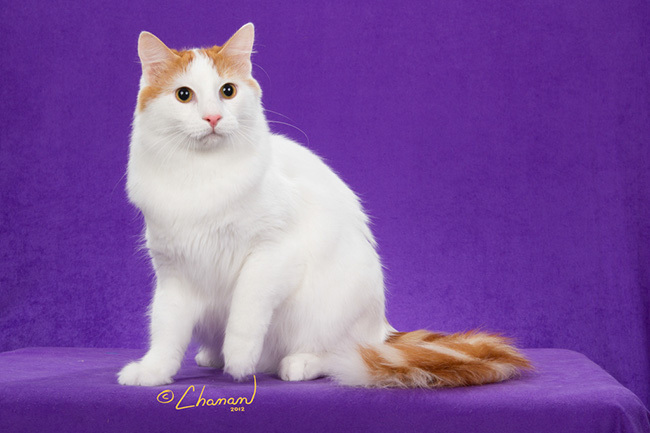 While there are only a few Turkish Van breeders in the United States, there is more than one established responsible breeder. If you contact one of us, we will share the names of other quality catteries who may have what you are looking for if we don't. A good breeder will allow you to visit their cattery and see some of their cats. I personally do not allow visitors to pregnant cats or to kittens before they have been vaccinated but we will have other cats to be seen. You are welcome to pick up your kitten. A good breeder will want to ensure that you will provide what the kitten needs. They will want to hear how the kitten is doing in their new home and will be there to answer your questions in coming years. If something doesn't sound right when you talk to the breeder, perhaps it is a good time to ask for a second opinion. A good breeder will make sure their kitten has had their 2 FVRCP vaccines, a vet checkup, is spayed or neutered before placement and has been on a regular program to prevent fleas and worms. They will keep the kitten with their littermates for proper socialization until they are 12-13 weeks old. This is to ensure good personality development and to give the 2nd FVRCP vaccine. Be cautious of a breeder that cuts corners on this health care, sells younger kittens or offers a lower price unless the kitten is an older one. A good breeder will spend time with each kitten daily and will have a limited number of kittens each year so they have the time to spend with each one. They will be sure the queen has adequate rest before she has another litter.